1. 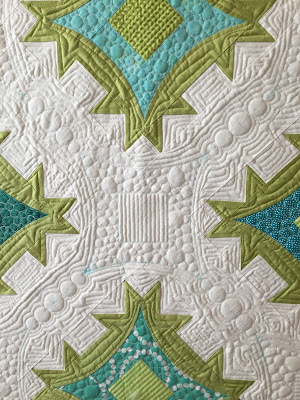 If you use a disappearing blue pen to mark the quilting lines., like I do. This helps to get rid of them completely. 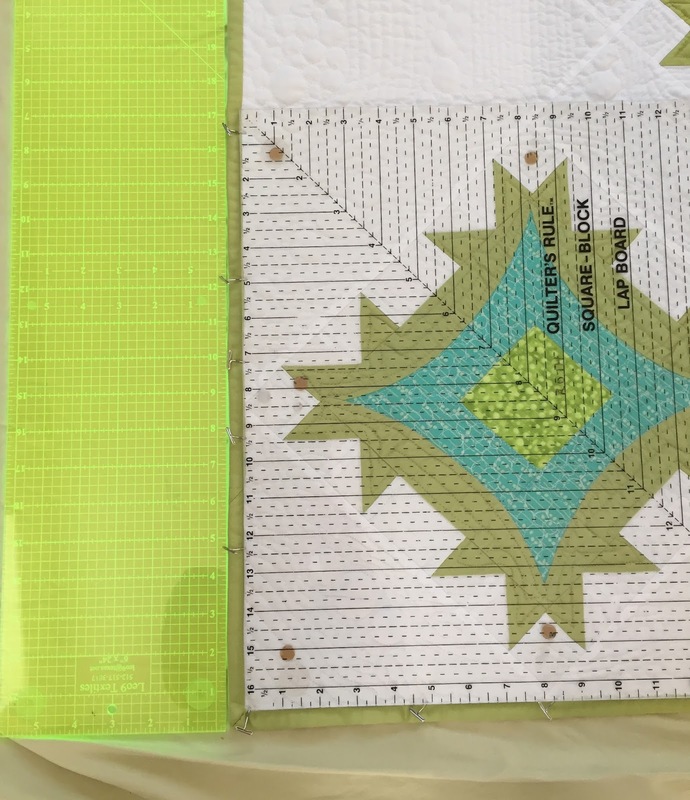 Instead of just spritzing the areas that are marked, get the entire quilt wet. 2. 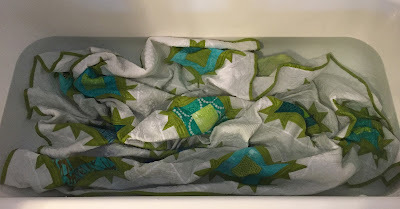 If you use a lot of dissolving products in your applique quilts, like I do. This includes a dissolving foundation (like Ricky Tims Poly Stable Stuff), school glue, and dissolving thread for basting. Soaking the quilt is the only way to insure that all of these products are dissolved. 3. If you use starch, and I don't like to leave it in the completed quilt. 4. 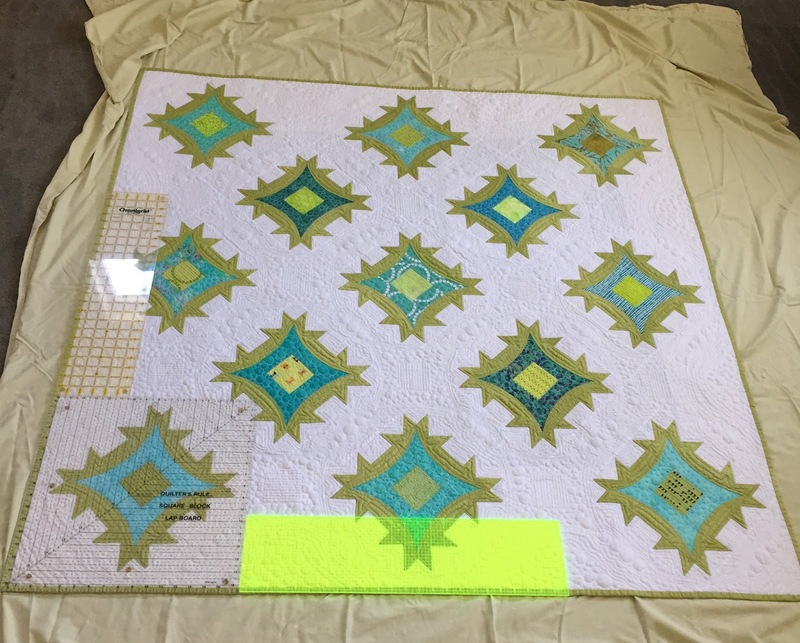 If you like to be able to block your quilts. Getting them wet helps to be able to get the fibers to relax and stretch a tiny bit. It also helps to get the quilt flat if you're entering competitions. 5. The quilt is almost always dragged around from house to house as it is being constructed or finished (especially the binding part). If you want to get all of the dirt, pet hair, and body lotions removed; maybe even some food or blood; it needs to be washed. OK, so here are the pictures of the process. Here is a completed quilt, showing the blue markings and the wonkiness (is that a word?) from the quilting phase. Fill a tub with just barely lukewarm water and add 1/2 cup of Orvus Paste (horse shampoo). I buy it in a big jug from the farm supply stores and it last me about 4-5 years. I also toss in a color catcher. Then I dunk in the quilt and swish it around gently with my hands. If the water starts turning color, I don't let it sit for too long, because this could be fugitive dye. I let the water out, and refill the tub in that case. If the water is milky or gray looking, this is OK. It's probably the dissolving products. Let the quilt soak for 10-15 minutes. Then let the water out and gently squeeze the quilt. Fill the tub and rinse the quilt a couple of times. Do this until the water is running clear and the soap is clearly out of the quilt. Gently squeeze excess water from the quilt. Remove the quilt gently and put it into a plastic laundry basket. Put the quilt into a washing machine and run ONLY the spin cycle. 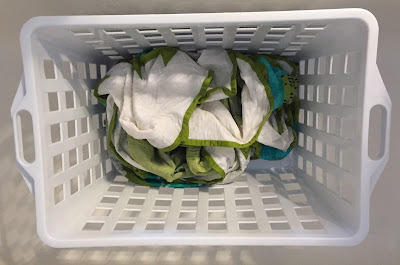 Put the quilt into the dryer and on air or very low setting, dry it for 5-10 minutes until the quilt is still damp, but not sopping wet. 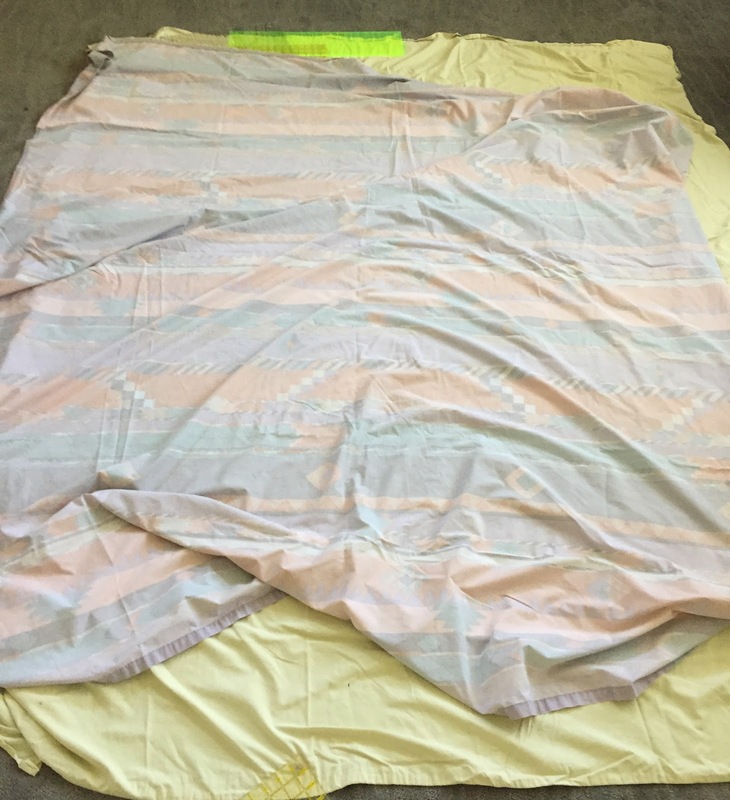 Lay down a sheet on the floor, then the quilt (smoothing it out as you go), then another sheet. You can start to square up the corners and even out the sides now, but don't do too much yet. Put some fans on the quilt and air dry for a couple of hours. Jamie Wallen suggests that you purchase some indoor/outdoor carpet and lay the quilt and sheet on top of this. Let this sit flat until the quilt is nearly dry. 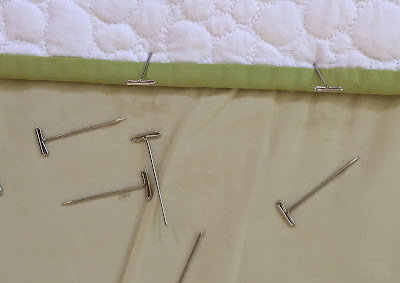 Remove the top sheet and pin the quilt so that it is square and has even sides. You may need to smooth out the quilt or pull gently on the corners or the sides to get this into shape. Remember that knitters and crocheters have used this blocking technique for years. It is an important last step to get a nice flat and square quilt. Some people will put something large on top (like their large cutting mats) to help flatten out the quilt. If there is a gap on the sides, gently pull and pin the quilt until it lies even with the edges of the rulers. I put 2 end to end, or even 3 (since I have 3 large rulers and a couple of large square rulers). Let the quilt dry completely as it is laying flat. I hope you will wash your quilts and try blocking them too. Thanks for sharing how you wash and block a quilt. I do much the same as you, although I often put the quilt in the washing and give it a spin to remove some of the excess water so it dries faster! Thanks for sharing your tips regarding washing and blocking the quilt! It pretty much easy to follow. I am going to do the same with my next quilt!